Hi friends. Hope you had a great weekend. 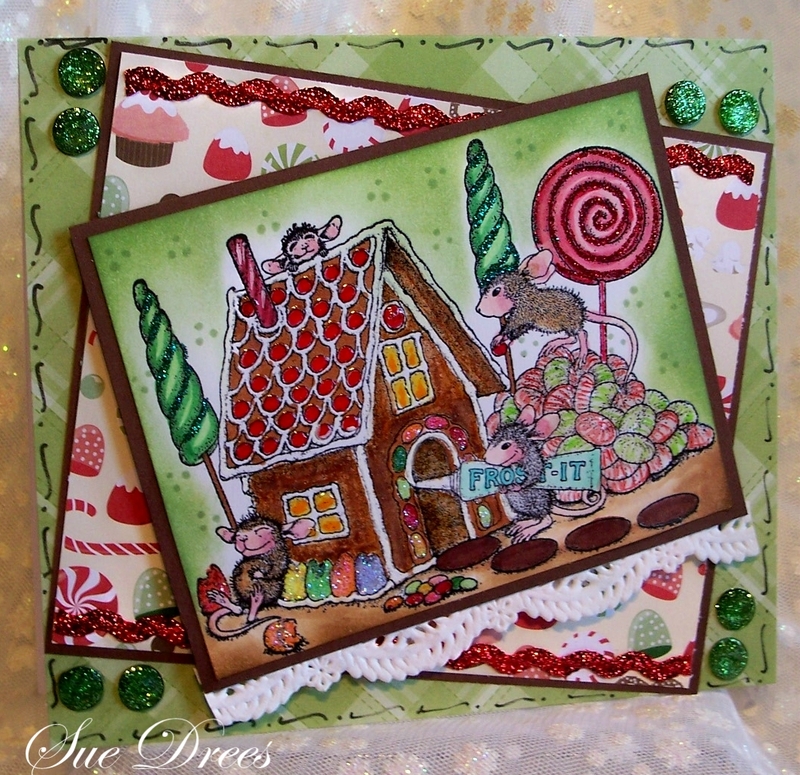 Just wanted to remind you that the House Mouse and Friends Monday Challenge is still going on until Saturday at midnight EST. 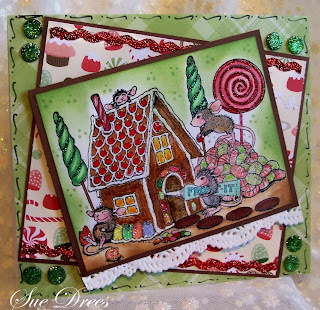 Two great prizes are on offer for this challenge with a theme of "Getting ready for Christmas"
All the details are on the House Mouse and Friends Monday Challenge site. Here is my card for the midweek. Love this large stamp of the mice making a Gingerbread house and decorating it up for the holidays. Hope you have a chance to join the fun. terrific!! great card with the stamp. also your colorize is stunning!! Wowzer, that was some intense coloring! It is just gorgeous, Sue! WOW!! 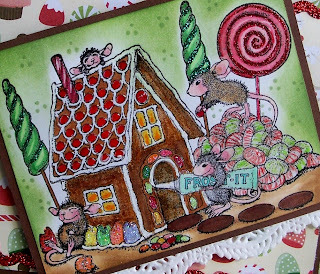 such a yummy image and coloured so beautifully..
the cards under are so lovely and great dies. Such a sweet image, Sue, lovely colours and colouring. This is such a sweet and delicious image. I love all the bright, cheery and festive colours too. Super beautiful card, fabulous colouring and wonderful design. It's a beaut Sue, love it! If only gingerbread houses were assembled and decorated this easily! LOL Great card, beautiful coloring! wow, what a lovely card you made! I really love the colors you chose for it!!! The motive you chose is fantastic. Aren't those little critters just the cutest you ever saw? So cute! I love the fun, vibrant colours and you've embellished the image beautifully with all the wonderful glitter. Looks fantastic! Hi. I am looking for the Sue Drees who sent a huge box of unbelievably gorgeous cards to my Card Drive for Addison. Is that you? there was no contact info. If this is you, THANKS and they were received. I had tears in my eyes as I went through them waiting for my son to get out of school. these are so beautiful and special and will be such a blessing to my friend's family! Just beautiful, I love the depth of color and the green background. I also love the sparkle on the gum drops.